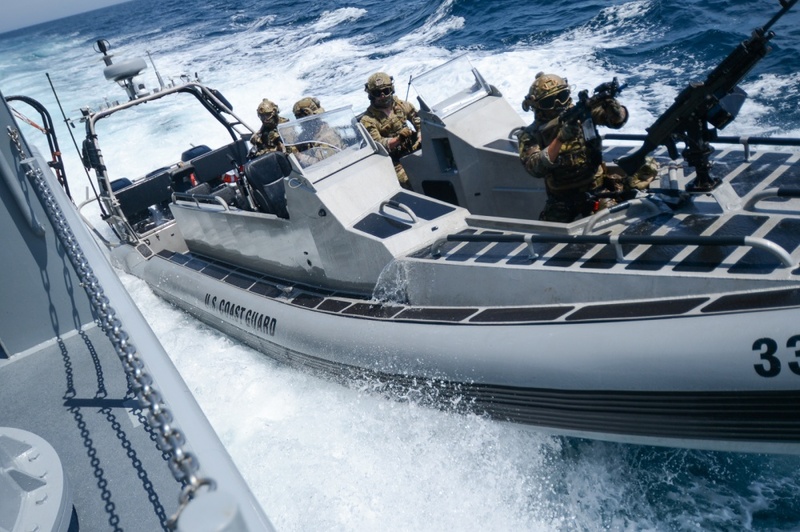 Twenty-five nations, 46 surface ships, five submarines, 17 land forces, more than 200 aircraft, and 25,000 personnel participated in the latest RIMPAC exercise. Nations represented included Australia, Brunei, Canada, Chile, Colombia, France, Germany, India, Indonesia, Israel, Japan, Malaysia, Mexico, Netherlands, New Zealand, Peru, Republic of Korea, Republic of the Philippines, Singapore, Sri Lanka, Thailand, Tonga, United Kingdom, United States and Vietnam. And the Coast Guard was there. USCGC Bertholf even headed one of the Task Groups. But I have yet to see any stories from the Coast Guard about Coast Guard participation. Consequently there is not a lot I can say about what the Coast Guard did. Can’t help but think this was a missed opportunity. All we seem to have are Navy photographs with their captions. 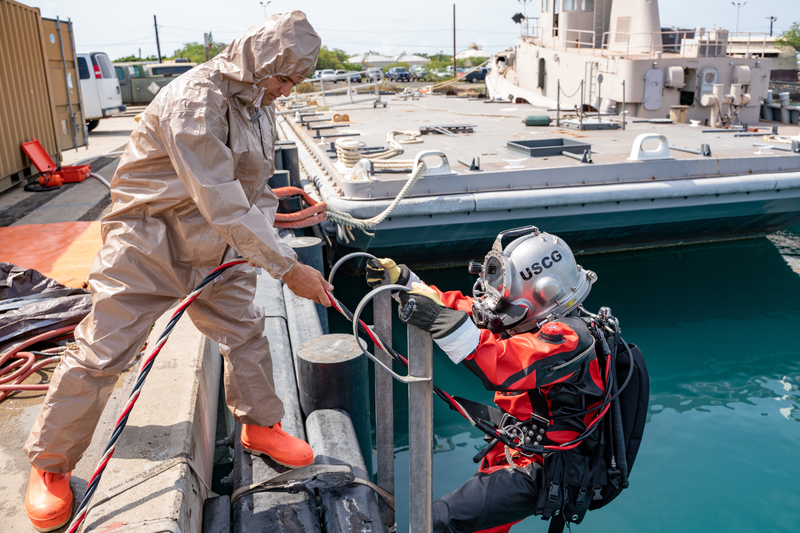 One of the highlights of RIMPAC is always the ability to test ordnance against an actual ship in a Sink-EX. This time there were two target ships, the former USS Racine (LST-1191) and a frigate, the former USS McClusky (FFG 41). This RIMPAC was a bit unusual, in that US Army and Japanese ground units participated in the Racine Sink-EX. Using targeting from a US Army Gray Eagle drone and AH-64E team, the former Racine was hit by four Japan Ground Self Defense Force surface to surface missiles, a Naval Strike Missile fired from a US Army vehicle with a Palletized Load System (PLS), five HIMAR artillery rockets were fired (no indication how many hits), a Harpoon missile fired by an Australian P-8 Maritime Patrol Aircraft, and another Harpoon and a torpedo from a US submarine. I presume this means two surface launched by the Singapore Navy and two air launched against the FFG and one sub launched and one air launched by the Australian P-8 against the LST. An Air Force launched LRASM was originally planned to be used against Racine, but I have seen no indication one was launched during the exercise. 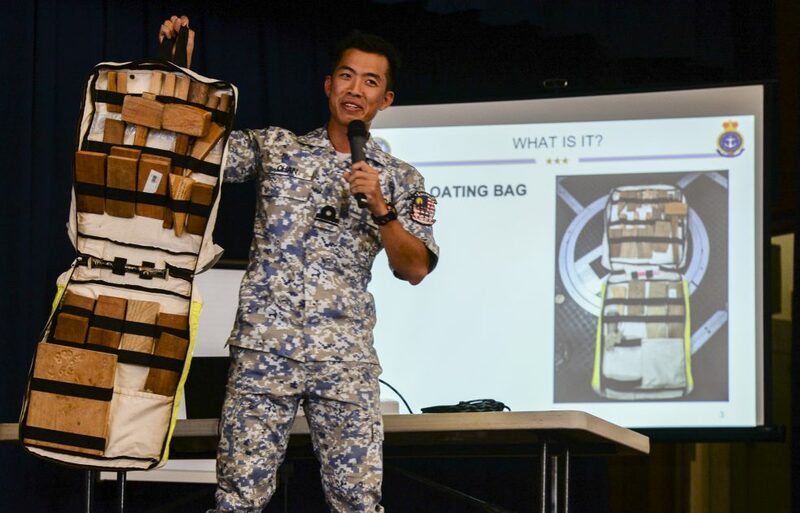 The Naval Institute reported on a new RIMPAC program, the “Innovation Fair.” While apparently it included a lot of high-tech presentations; it was a simple low-tech “why didn’t I think of that” good idea that won the prize, and it looks like something the Coast Guard could use, a floating and reflective damage control (DC) bag. This entry was posted in ASuW, Training, Weapons by Chuck Hill. Bookmark the permalink. Bad idea. Soft kill measures can deceive such missiles quite easily, and the missile better be prepared to search for a real target after passing through a non-existing one. A programming for waterline strike or terminal dive would lead tot eh missile usually being lost on its first target approach. What matters is the entire chain from launch to secondary effects in the target. To maximise one step at the expense of others (here the probability of actually striking a real target) is a poor idea. As ASCMs get smarter with recognition systems and less likely to be seduced by soft kill systems and increasingly challenged by hard kill systems, then I would think it more important to go for the kill shot by targeting the waterline. That’s still a poor choice. A missile should rather aim at the VLS silo. A 150…250 kg warhead (HE with lots of tiny EFP cavities that project in all directions) is not going to do enough damage to actually sink a ship, it’s just going to list and/or counterflood. The tiny EFP holes will be plugged or neighbour compartments filled with foam. CODOG and other popular propulsion patterns have enough redundancy to keep the ship moving at 18+ kts with half of the engine power gone. I can appreciate the desire to create a secondary explosion(s) in the magazines. Good quality missiles won’t have any secondary explosions, but the many EFPs will pierce them, cause fires (see the SM-2 burning out in the German frigate’s VLS recently; the warhead burnt, it did not explode). The point is that lots of munitions in the VLS will be knocked out by a hit. That’s more important than knocking out radars, which can be substituted for through CEC nowadays. Alternatively, a submarine-launched missile could aim at the towed sonar installation or the hangar to knock out the surface ship’s ASW capability. It’s not necessary to sink any warships in the decisive phase of battle. You can bomb or torpedo them later when they’re incapable of defence or you could let them escape. To sink a ship may be unnecessary and useless cruelty; no navy is going to be able to get many warships repaired in a one- or two-year war anyway. More likely than not the capacities of a nation like the U.S. would be burdened to the limit with the repair of 3 badly hurt destroyers in less than 18 months. The PRC may be better at repairing with its gargantuan shipyard industry, but I suppose those shipyards would be hit over the course of a year of warfare anyway. I saw recently where a couple versions of Standard are getting software updates to make them “quick & dirty” supersonic anti-ship missile. First thing I wondered was warhead effectiveness. Short of the 1000-lb Tomahawk unitary warhead, I’m not sure any US missile has a truly devastating warhead. Even the Harpoon hitting near waterline level didn’t break an OHP in two during a sink-ex, and with no damage control at all, it took quite some time to sink… Warhead / performance effectiveness really need to be looked at. BUT, it brings up an important point: With China and Russia developing “hypersonic” and “Carrier-killing” anti-ship missiles, as a follow-on to the interim Standard Missiles being reprogrammed, why doesn’t DARPA/USN forego the VLS/TT dimensions and build a larger, faster, longer-ranged, deadlier AShM? Something too big to fit in VLS or TTs. Something where 2 single missiles could be mounted on LCS or quad launchers could be put on DDGs and CGs? With the larger size, imagine the potential for a land attk. missile version to replace Tomahawk (possibly with a more fuel-efficient subsonic engine which fits in place of the hypersonic AShM version? I’d have to look at bomb-bay dimensions, but this could also potentially replace SRAM and Tomahawk in strategic bombers too (though I’d rather not hamstring designers by giving them dimensions they must fit within again; mission should drive design). The USN considers ship killing to be the job of naval air and SSNs. The new LRASM follows the subsonic & stealthy approach and has a roughly 1,000 lbs warhead. Completely agree that is their philosophy, but what if surface warfare community is all that’s available or left? USN has had a change of heart and are increasingly looking to surface vessels as ASCM launchers. Naval Strike Missile chosen for LCS and FFG expected to armed with ASCMs. They are even talking about putting ASCMs on amphibs and supply ships. 21″ torpedo tube and Mk 41 VLS are not really that much of a constraint in that the Tomahawk fits these. So far no VLS version of the Harpoon, but it does look like it may be going back on subs, since one was sub launched at RIMPAC. Even so that does not make to much sense to me, would prefer to have an anti-ship/land attack version of Tomahawk which has both longer ranger and a larger warhead. Use of Standard in an anti-ship mode has a long history, See Operation Praying Mantis. It is something of an expedience, and before it only worked line of sight. Using the Standard 6 makes some sense tactically in that you can make an urgent attack, launching both SM6 and sub-sonic ASCMs. The SM-6s will arrive first and while they may not sink the ship, if they hit, they are likely to degrade the defenses of the target before the sub-sonic ASCMs arrive, disabling radars and ESM systems and the like. Agreed that standard was always dual-role, but surface attack has always been a “secondary role.” It was intended to replace Terrier and Tartar with the addition of surface-to-surface, so it could be a “standard” (all-purpose) missile. Some of this “all-purpose” nature showed when it was also modified into an Anti-Radiation Missile. However, the warhead, motor, and software have always been anti-air centric. It works, but Standard was born out of the lesson of the Three-T missiles; instead of multiple systems, make one system which, with some tweeks, does everything. We know that *trying* to design an all-purpose military item never works out quite as well as an “accidental” multi-purpose item (a.k.a. F-35 vs. the F-4 Phantom). 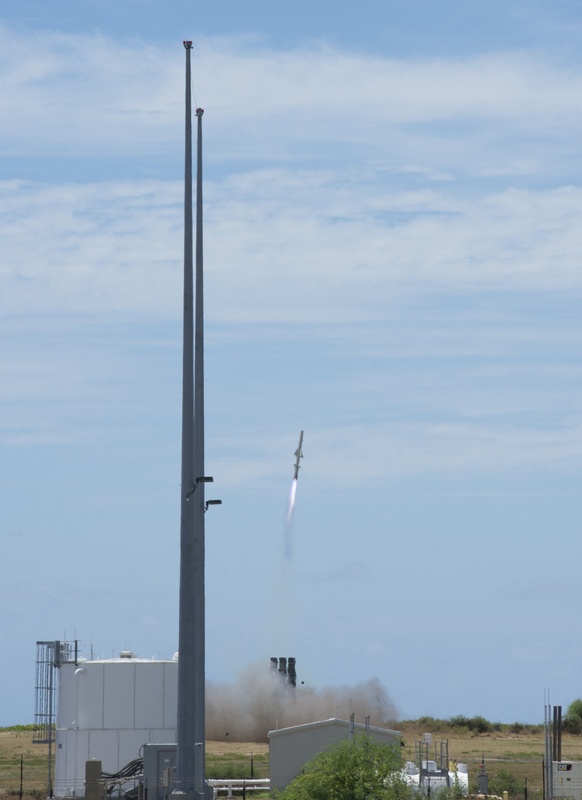 One major disadvantage of using SM-3 or -6 or another version, is applying that magazine space to anti-ship use reduces the number of missiles available for air defense. As far as missiles getting smaller, I agree it’s happening, I just don’t see the wisdom of it. Using a smaller missile like RAM makes a lot of sense in the self-defense role. The old Sea Sparrow had 8-rd launchers. ESSM fits 2 or 4 missiles in a VLS cell, but RAM takes up no VLS cells and has 11 or 21 missiles. This makes sense – rapid response, high-speed, small warhead optimized for mission, higher magazine capacity without degrading VLS magazine space. Progressive improvement in capability makes sense as the concept of saturation attacks needs countered. However, for an anti-ship missile, this is folly. Setting one’s offense up to rely on saturation attacks is very risky. Hope is being placed on one (or a few) smaller missiles leaking through countermeasures and active defenses, which tactically makes sense, but what does the smaller warhead achieve when the leaker(s) get through? I agree a 500-lb class warhead is a tactical kill, because the ship will be focused on survival after that, and many systems will be disabled. But what of 100-300 lb warheads? It will all depend on where they strike and explode. It is risky to rely on this mechanism for a tactical kill, and a sinking would be surprisingly lucky. The LRASM is a fantastic missile which answers all the needs, but one: speed. It’s ConOps includes a lot of range or possibly better said, loiter/search time. I’d like to see 1/3 of that sacrificed for a higher-speed motor to complicate the defense’s efforts to destroy it. As to size of the ASCMs, it appears the trend is toward mounting smaller, but more numerous missiles, so that they swarm and overwhelm the defenses. You see this with the NSM, which is about 2/3 the size of Harpoon. 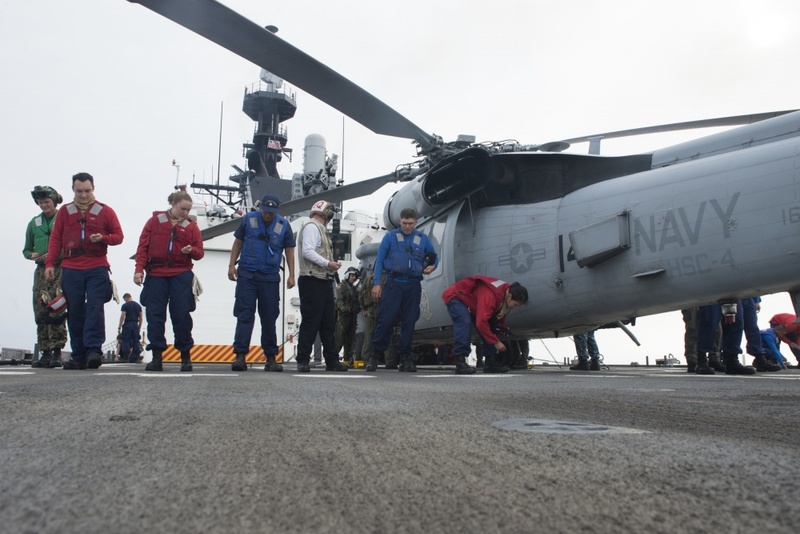 Bertholf returns from the RIMPAC exercise.